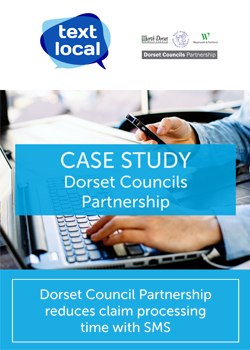 The ground-breaking Dorset Council Partnership combines services for West Dorset, North Dorset and Weymouth & Portland Borough Councils. The Partnership aims to transform services for their communities and reduce running costs by utilising a combined workforce. The benefits team within the Council were looking to streamline their contact centre services, with the need to regularly send out appointment reminders, claim updates and follow-up information. The team also wanted to offer customers easy access to online services and their portal, making the most of the dorsetforyou pages. By implementing SMS in to their communications, the Council saw a significant reduction in benefit processing time and could readily provide links within SMS to online services. They benefitted from a quicker response rate for information or contact requests. Officers saved time usually spent chasing customers by email or multiple voicemails, which could be better spent helping those who need more support. SMS helped to reach more vulnerable residents that had often not picked up calls. Feedback showed a preference to being contacted by text. Overall using SMS has helped to modernise services for the Council Partnership, contributed to a reduction in processing time and improving service levels for customers. • An 18.5% reduction in benefit claim processing time for WDDC, an average of 4.61 days for each claim.